Psychic Squad, known in Japan as Zettai Karen Children (絶対可憐チルドレン, Zettai Karen Chirudoren, lit. Absolutely Lovely Children) is a Japanese shōnen manga by Takashi Shiina about three young problem girls with outstanding psychic powers and a young man with no special powers at all tasked to guide them properly while dealing with all the commotions they cause, including their obvious infatuation with him. The manga started being serialized in Shogakukan's manga magazine Weekly Shōnen Sunday in 2005. An anime series by SynergySP, titled Psychic Squad in North America began on April 6, 2008 which ran for fifty-one episodes and had a special OVA released in July 16, 2010. A spin-off focused on main antagonist Kyōsuke Hyōbu titled Zettai Karen Children: The Unlimited, titled Unlimited Psychic Squad in North America and animated by Manglobe, began airing on January 7, 2013. In the future, as people with ESP increase in numbers, so does the possible good and evil they can cause to society. The Japanese government establishes of the Base of Backing ESP Laboratory (B.A.B.E.L.) a special esper organization tasked with dealing with situations that can't be resolved by ordinary means, including dealing with espers engaged in criminal activity. Kōichi Minamoto, a 20-year-old prodigy is assigned by B.A.B.E.L. to the task of supervising the most powerful espers in the country, a trio of gifted but mischievous 10-year-old girls known as "The Children". As the series progresses, The Children and Minamoto must deal with several enemy organizations, each with conflicted views regarding the role of espers in the world, including "P.A.N.D.R.A. ", a cadre of rogue espers determined to wage war against the rest of mankind, the "Black Phantom", a mercenary organization who brainwashes espers into living tools of destruction and the "Normal People", composed solely of non-esper individuals who view espers only as a threat to be vanquished. Psychic Squad, written and illustrated by Takashi Shiina, started in Shogakukan's Weekly Shōnen Sunday in 2005. Shiina developed the series out of a short story he had written in a special issues of Shōnen Sunday. The series was essentially the same, except for the fact that Kōichi Minamoto was named "Hikaru Minamoto", and he also had psychic powers. An anime adaptation produced by SynergySP began airing in Japan on TV Tokyo on April 6, 2008, and contained fifty-one episodes (and one filler). The anime has six pieces of theme music; two opening themes and four ending themes. The first opening theme is "Over The Future" by Karen Girl's, the first ending theme is "Zettai love×love Sengen!!" (絶対love×love宣言!!) by "The Children starring Aya Hirano, Ryoko Shiraishi and Haruka Tomatsu"; the second ending theme is "Datte Daihonmei" (DATTE大本命), also by Hirano, Shiraishi, and Tomatsu. From episode 27 onwards opening theme has changed to "MY WINGS", once again by Karen Girl's, ending theme changed to "Break+Your+Destiny" by Yuuichi Nakamura, Kishō Taniyama and Kōji Yusa and "Soushunfu" performed by Aya Hirano, Ryoko Shiraishi and Haruka Tomatsu. In episode 46 of the series, the opening theme, "MY WINGS", was sung by Aya Hirano, Ryoko Shiraishi and Haruka Tomatsu while the ending theme was "Zettai love×love Sengen!! ", sung by Karen Girl's. The series has been licensed by Sentai Filmworks will be released under the title Psychic Squad; due for release in 2012. An OVA was released in summer of 2010 that includes original material based on the junior high school story arc. The opening theme for this OVA is "Seventh Heaven" by The Children and the ending theme is "Out of Control" by Karen Guy's. 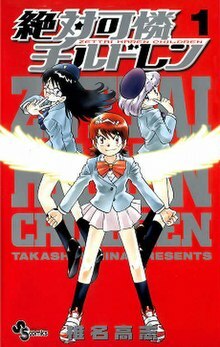 In September 2012, a new anime project based on Zettai Karen Children was announced on Shonen Sunday. Later it is revealed to be an original spin-off series focused on main antagonist Kyōsuke Hyōbu and his organization known as P.A.N.D.R.A.. Titled as The Unlimited - Hyōbu Kyōsuke it was animated by Manglobe and premiered on TV Tokyo and other stations in 2013. New additions to the cast include Nao Tōyama as Yūgiri and Junichi Suwabe as Andy Hinomiya while almost all characters from the first TV Series are voiced by the same actors from then. The opening song is "LAST RESOLUTION" by Emblem of THE UNLIMITED and has two versions, one in English and the other in Japanese. It also has eight ending songs: "OUTLAWS" by eyelis, "BRIGHTEST LIGHT" by Yuichi Nakamura & Kishō Taniyama, "DARKNESS NIGHT", another version of "BRIGHTEST LIGHT" by Kōji Yusa & Junichi Suwabe, "BRAND NEW EDEN" by Kōji Yusa, "ADVENT" by Kōji Yusa, another arrangement of "DARKNESS NIGHT" entitled "DARKNESS NIGHT (Hyōbu Arrange.)" also by Kōji Yusa & Junichi Suwabe, "Sora no Hate (空の涯て;End of the Sky)" by eyelis, and a secondary arrangement of "DARKNESS NIGHT" called "DARKNESS NIGHT (Hinomiya Arrange.)" once again by Kōji Yusa & Junichi Suwabe. There is an insert song in the final episode called "Mirai Monogatari (未来物語;Future Story)" by Nao Tōyama. The series, while similar in setting and characters, is darker and more serious in plot and tone than both its predecessor and the original manga material being transposed. The series has been licensed by Sentai Filmworks under the title Unlimited Psychic Squad; due for release in 2015. A video game for the Nintendo DS developed by Konami entitled Zettai Karen Children DS: Dai-4 no Children (絶対可憐チルドレンDS 第4のチルドレン) was released on September 4, 2008. Kaoru Akashi appears as a fighter character in the fighting game Sunday vs Magazine: Shūketsu! Chōjō Daikessen (サンデー VS マガジン 集結！ 頂上大決戦) for Sony's PlayStation Portable. Characters Aoi, Shiho, Minamoto, Fujiko and Hyōbu also make appearances as part of special moves or as support. The game was also developed by Konami and released on March 26, 2009. ^ "Zettai Karen Children Manga Returns on August 23". Anime News Network. Retrieved May 28, 2018. ^ "Psychic Squad". Sentai Filmworks. Retrieved 2019-02-06. ^ "Zettai Karen Children episode listing" (in Japanese). TV Tokyo. Retrieved 2008-06-07. ^ "Sentai Filmworks Licenses Zettai Karen Children Anime". Anime News Network. 30 January 2012. Retrieved 30 January 2012. ^ "Zettai Karen Children's New Anime Is Hyōbu Spinoff". Anime News Network. 19 October 2012. Retrieved 19 October 2012. ^ "Sentai Filmworks Adds Unlimited Psychic Squad Spinoff Anime". Anime News Network. 2014-12-16. ^ "Zettai Karen Children DS game official website" (in Japanese). Konami. Retrieved 2008-08-17. ^ "Sunday VS Magazine: Shūketsu! Chōjō Daikessen game official website" (in Japanese). Konami. Retrieved 2009-11-18. This page was last edited on 6 February 2019, at 19:16 (UTC).